Each style of Citizens will be represented with the signature "h" but with a slight twist on the logo depending on the cut on the jean. 'DYLAN' Boyfriend crop jeans in Drama. Narrow through the thigh. Thigh laying flat - 10in. rise - 9in. great for a tall person.hard to find 34in inseam. RARE STYLE. unique front design with double buttons & unique style of back pockets with buttons. Solid Print. Cut Number: 29. Leg Opening: 22". Light Wear, Wear on Back Hem. Rise Height: 12". If an item were in excellent condition with an easily replaceable button then it would be graded as a FAIR. Citizen's of Humanity Bootcut Dark Wash Jeans. COH Avedon 133 low-skinny jeans. Size 29X33. Citizens Humanity 30 x 32.5 High Rise Wide Leg HUTTON #251 Jeans Dark Wash Women. Shipped with USPS Priority Mail. We request that you select "Item does not fit". Citizens of Humanity Women’s Off White Jeans Size 29. Condition is Pre-owned. Shipped with USPS Priority Mail. In excellent condition. Waist about 14”, rise about 11.5” and inseam about 28”. No returns and no international shipping. Please feel free to ask any questions. Excellent condition, no stains, holes, pilling, or wash wear. Some intentional distressing. I combine shipping so please check out everything I have for sale. Citizens of Humanity. Kelly #146 Stretch. Leg opening = 9.5"s. Rise = 7"s. waist = 16"s. Look at all the pictures for the exact condition of the item listed. Wayne's World of Collectibles. Inseam = 30"s.
Citizens of Humanity. Kelly #146 Stretch. Leg opening = 9.5"s. Rise = 7"s. waist = 16"s. Look at all the pictures for the exact condition of the item listed. Wayne's World of Collectibles. 53 cotton 23 rayon 18 poly 1 spandex. Front Rise 8.5. Hem width 5.5. Citizen of Humanity Rocket High Rise Skinny jeans are in excellent condition! Inseam 29.5". COH Avedon. Model: Avedon - Low Rise Skinny. Low rise skinny leg 5-pocket styling, zip fly with button closure. Type: Skinny Leg. Leg Opening: 5". Front Rise: 8". soft and comfy. This is a pair of Kelly Bootcut jeans from Citizens of Humanity. They have a mid rise and the cotton blend fabric has Elastane for a comfortable fit. Style: Kelly Bootcut. Color: Dark Blue Wash. Care Instructions: Machine Wash. NOTE: there is a hole next to the back pocket. PLEASE see picture. Easy fix CITIZENS OF HUMANITY Sz 28 Destroyed Rocket High Rise Skinny Jeans . Condition is Pre-owned. Shipped with USPS Priority Mail. Shredded holes and a dirtied wash lend time-worn appeal to high-rise Citizens of Humanity skinny jeans. 5-pocket styling. Button closure and zip fly. Fabric: Stretch denim. 91% cotton/8% elastomultiester/1% Spandex. Wash cold. Made in the USA. 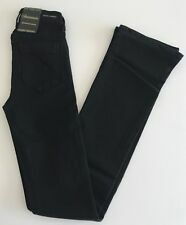 ** I COMBINE shipping, SEE my cute items, * THIS IS SO CUTE BY CITIZENS OF HUMANITY SZ 28, THESE ARE DISTRESSED ROCKET HIGH RISE SKINNY STRETCH JEANS, YOU WILL LOVE! FIT TRUE TO SIZE. A CUSTOMER FAV!! LOVE!! IN EXCELLENT USED CONDITION. Citizens of Humanity Ava #142 Stretch Low Waist Straight Leg Jeans. 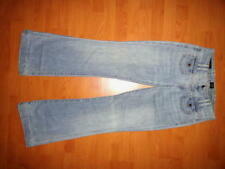 Medium blue wash. Sz 27. Condition is Pre-owned. Small amount of wear visible on bottom leg hem. Shipped with USPS Priority Mail. 30" waist, 24 " inseam. Stretch - low waist - cropped. Excellent condition, like new! Front Rise: 9". STILL NOT SURE?. These straight-leg jeans feature 5-pocket styling and a single-button closure. Signature 'h' stitching at back pockets. Whiskering and wrinkling at front and behind knee. Worn edges and moderate distressing. citizens of humanity Jeans. ChrissyUber High Rise Skinny. Size 26. Distressed In. Condition is Pre-owned. Shipped with USPS Priority Mail. Designer jeans by Citizens of Humanity! Stretch blend denim for a curve hugging fit. Flattering darkwash flare leg. Good pre-owned condition, minor signs of wear, see photos for details. CITIZENS OF HUMANITY Women’s Emerson Slim Boyfriend Jeans Size 29 Distressed. Inseam measures 27 inches. Waist one way across measures 16.5 inches, rise measures 9.5 inches. Button fly, distressing throughout, the knees have fabric panels beneath so there’s no actual holes. Slight distressing also next to fly see last photo. Condition is Pre-owned. Shipped with USPS Priority Mail. In excellent condition. Retail at $288. Waist is about 14”, rise about 11” and inseam about 27.5”. Super sharp jeans! No returns and no international shipping. Please feel free to ask me any questions. New ListingCitizens Of Humanity Women's Avedon Skinny Leg Dark Wash Jeans Sz 25 Low Waist. Citizens Of Humanity Jeans 28. Condition is Pre-owned. Shipped with USPS Priority Mail Flat Rate Envelope. Citizens Of Humanity Jeans, New without tags, Amber Stretch #263 High Rise Bootcut Jeans Size 26. Beautiful medium/dark wash. No flaws Measurements laying flat: Waist 14.5" Rise 8" Inseam 31.5"
Front rise 7.5". Leg opening 9.5". Leg Opening: 8". Rise Height: 7". Inseam: 27. Cotton Blend. Solid Print. Waist: 24". Very Good Condition, No Significant Flaws or Wear. Pocket: 3 Front Pockets, 2 Back Pockets. The Charlotte Crop features a high-rise, straight leg and cropped inseam. Crafted from non-stretch denim, the Wild One wash is a pale indigo featuring fading throughout the leg and distressing at the hem. From the Citizens of Humanity website The Charlotte Crop features a high-rise, straight leg and cropped inseam. Crafted from non-stretch denim, the Wild One wash is a pale indigo featuring fading throughout the leg and distressing at the hem. Citizens Of Humanity 24/00 Avedon Low Rise Skinny Leg Stretch Blue Jeans. Condition is Mint Pre-owned. Shipped with USPS Priority Mail. Citizens of Humanity Jeans Boho Stretch #111 Low Waist Boot Cut. Gently worn in great condition. 29’ Inseam. Waist :32". Very Nice Well Preserved. New Citizens of Humanity Emerson Slim Boyfriend Jeans Cabrillo Sz 27 - SOLD OUT! Citizens of Humanity. Are crafted in stretch-denim with a relaxed boyfriend style. This slim-fit pair are accented with a mid-rise and button-fly fastening at the front. The cropped length gradually tapers in at the ankle, while the wash is faded and whiskered for a covetable worn-in look. 2XSXSSMLXL000246810121416182223 in.24 in.25 in.26 in.27 in.28 in.29 in.30 in.31 in.32 in.33 in. PPPS4P24P26P23 in.24 in.25 in.26 in.27 in.28 in.29 in.30 in.31 in.32 in.33 in.39 in. XSSM13571324 in.25 in.26 in.27 in.28 in.29 in.30 in.31 in. M8 Tall10 Tall24 Tall28 Tall30 Tall34 Tall25 in.26 in.27 in.28 in.29 in.30 in.31 in.32 in.